Halloween 2008 marked the one year anniversary of KreweDCM’s INVASION! 2007 parade. Fittingly, it was time for the Monster Military to make its second appearance in a celebratory gesture. KreweDCM chose to honor their monster veterans and the recently liberated living of Austin with VICTORY 2008. KreweDCM’s members had doubled, there was a new and improved Plague Doctor design, two new stilt monsters, and Cerberus was finally joined by his old compatriot Charon–still piloting his ferry boat from the River Styx. For most downtown party goers on Halloween 2007, expectations for that Wednesday night were the same as any year. Thousands of costumed revelers went downtown to celebrate Halloween–to see and be seen. The streets were full, but certainly not as crowded as the previous Saturday. Everything appeared to be Halloween as usual until 9:00 PM, when the crack of snare drums began to echo a death march between the high rise office buildings. 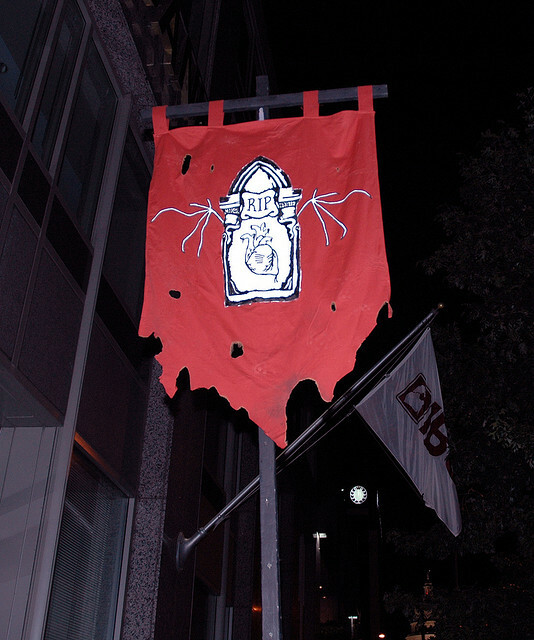 KreweDCM’s Invasion 2007 had begun and Halloween in downtown Austin would never be the same.